After being pounded with snow over the weekend, I was incredibly relieved when I was finally able to escape through the snow into town on Sunday. My destination: Goodwill...one of the few forms of retail therapy a broke college student can enjoy with minimal guilt. And my-oh-my was it ever worth braving the snow. At the last second I was able to find the cookie jar and although I was unsure at first, I have no regrets. I wouldn't normally have purchased it primarily because of a crack in the bottom but also because it is plastic﻿. I am in love with the color and graphic on it though and it will be no trouble to line it with something to keep my sweets safe. The sundae cups on the other hand...well I spotted them first thing from across the store. Three of them are the same and my research shows that they are definately mid-century. The one to the far left, however, I haven't been able to find any information on. Considering it weighs a hefty little amount though, I'm fairly certain it's likely around that time period as well. Now it is time to introduce my weakness: vintage Pyrex. I'm a bona-fide Pyrex nerd. You can only imagine how tickled I was at seeing the Pyrex flameware saucepan sitting happily on the shelf. I've seen very few of these in the wild and you definately couldn't beat the price. 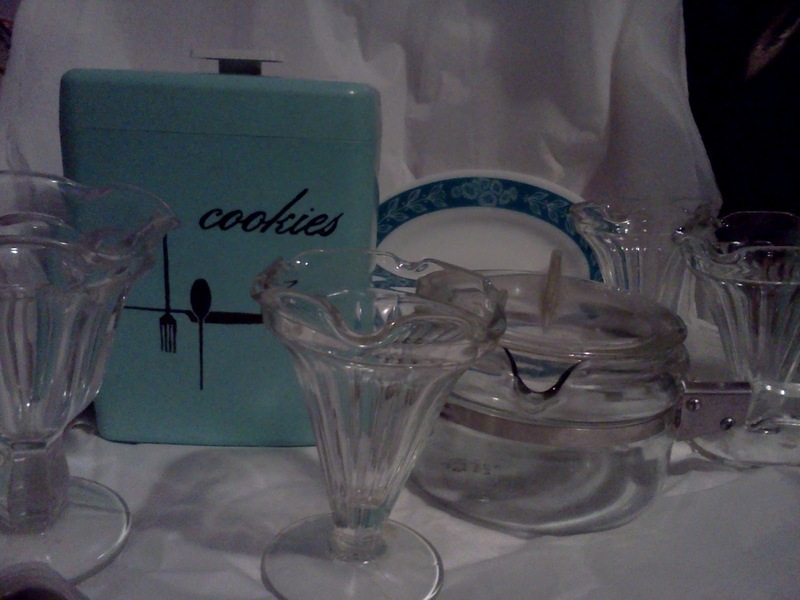 The small plate in the back is, although newer, also Pyrex.